P-38 Lightning Walk Around focuses on the P-38J variant but also covers F-4/F-5 Reconnaissance aircraft and the P-38M Night Lightning. This book follows the Squadron Walk Around formula. In other words, it is packed full of relevant and well captioned photographs. The book is in landscape format, with 80 pages between its soft cardboard covers. Inside, the book presents two pages in black-and-white, then two in colour, for the whole 80 pages. The 40 full-colour pages are used to good effect with many images of museum aircraft, wartime operational pictures, detail photos, and 16 colour profiles of a variety of Lightning variants and colour schemes. Six of the colour pages are dedicated to wartime photos of operational and test aircraft. More of these gems are scattered through the remaining pages. These terrific colour photos are almost worth the price of the book alone. A number of pages also have black and white contemporary photos too. The walkaround photos will be very useful to modellers who want to get close-up details of the cockpit, engines, wheel bays and much more. 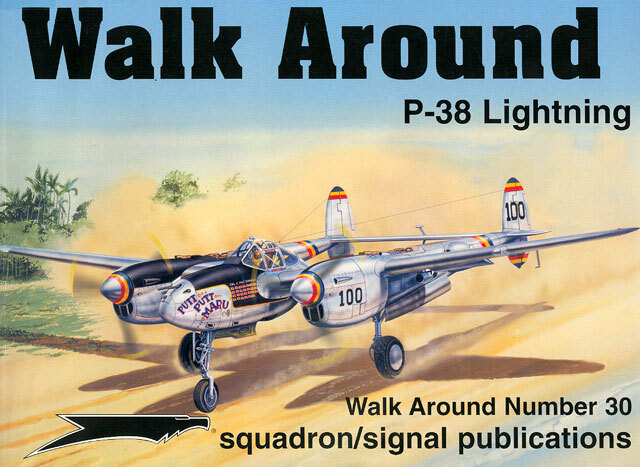 Squadron/Signal's P-38 Lightning Walk Around will be a very useful one-stop reference for anyone planning to build any of the various Lightning kits in 1/72, 1/48 or 1/32 scale.